The weather was clear as Boston Pilot, Captain William H. Lewis guided the City of Salisbury toward the outer harbor. Bound for New York with a cargo estimated at nearly $2,000,000 the steamer was nearing completion of a 10,000-mile odyssey, which included stops in Calcutta, India, Ceylon, the Malay States, Halifax, Nova Scotia and now Boston. It had been a hard passage. Before leaving Calcutta a Himalayan bear had escaped. Later at sea a king cobra cannibalized its mate and at Halifax twenty-five monkeys escaped. What else could go wrong? As Captain Lewis made his approach to Boston Harbor a thick fog bank engulfed the vessel. Although navigating in limited visibility was no simple matter then, or now, Lewis was confident of his position. Northeast of Graves Ledge Light, his Government charts showed plenty of water. Not long thereafter the steamer lurched to a halt. The vessel had impaled itself on an uncharted pinnacle of rock, near the outer edge of Graves Ledge. Later the Coast Guard would clear Captain Lewis of any wrong doing, finding that Government Chart #246 was incorrect. The chart showed 33 feet of water, over which the steamer should have easily passed. The freighter was in an awkward position. The pinnacle, over which the bow and stern hung, supported the ships midship section. Designed to be completely supported by water, the ebb and flow of the tide combined with a ground swell put undue stresses on the hull. Shortly after the freighter grounded, all but a skeleton crew of 14 men and 4 officers were removed. The next day, strange noises were heard emanating from deep within the steamer’s hull. Not long after noon the vessel began to strain and heave. The N.Y. Times reported: “As officers and men hurried to the afterdeck there was a crash from within the vessel, the forward portion rolled to starboard and, amid a swirl of the otherwise calm waters, disappeared from sight.” The City of Salisbury had broken just forward of the stack. “The stern of the ship trembled and then rose high in the water, but settled back on the ledge.” Meanwhile, the steamers crew was rescued by a nearby tug, which tempted fate, pulled up to the freighter’s stern and plucked them off. By midsummer the forward section had slipped into deep water and what remained atop the pinnacle was showing signs of stress. A crack had developed mid length of the half ship. 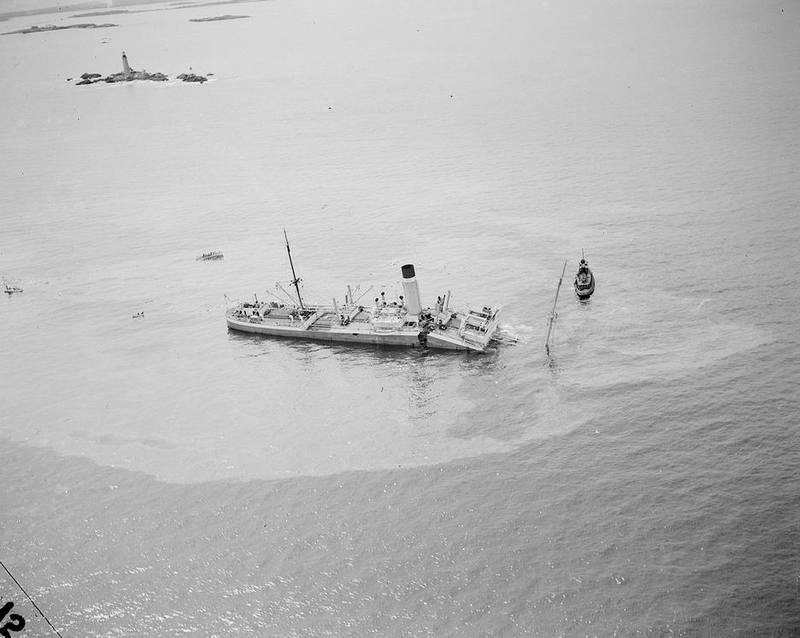 About two weeks before the stern broke up, author Edward Rowe Snow visited the wreck and wrote. “It was a weird sensation…the grinding and gnashing of the iron rods and broken timbers far down under the water could plainly be heard, and the steamer would shudder and jerk as the ground swell passed alongside.” Although the stern survived the great Hurricane of September 21, 1938, it succumbed to an October Northeaster. Today, the City of Salisbury exists as a scattered debris field around Graves Light in shallow water ranging from 20-50 feet in depth. Further from Graves, there is a more contiguous section of wreck in water ranging from 70-85′ in depth. This section tends to be the more popular since there is more wreckage to see whereas the wreckage by Graves Light is more sporadic. The deeper section of the wreck is mainly a jumble of hull plates, with bitts scattered about. Visibility tends to be in the 10-15′ range and the site definitely requires use of a guideline reel to navigate.